This month I was assigned the kitchen witch blog that is written by Rhonda who is a professional food photographer. Whilst I was searching her blog for a vegetarian recipe, I got thoroughly carried away as I spent such a long time drooling over her amazing food photos. I fell in love with all her background boards too. At the moment I have been trying to loose a few pounds so creating a salad for my lunch box everyday has been somewhat challenging. 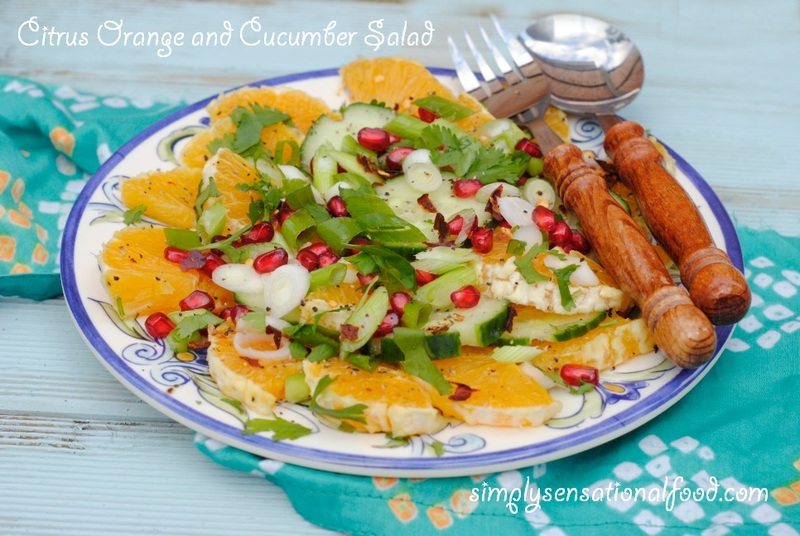 When I saw Rhondas citrus and cucumber salad I immediately fell in love with it. I loved the colour of the orange and the pretty cucumber rings and the overall presentation and the background board what can I say I want one like that too!!! The salad is simple but the flavours are amazing, light and tangy. It is delicious and I have since made it 4 times, its one for keeps for sure.You can see Rhondas Uniq citrus and cucumber salad here. The only addition I made was that I scattered a few pomegranate seeds on the salad to give it a little more colour and texture. 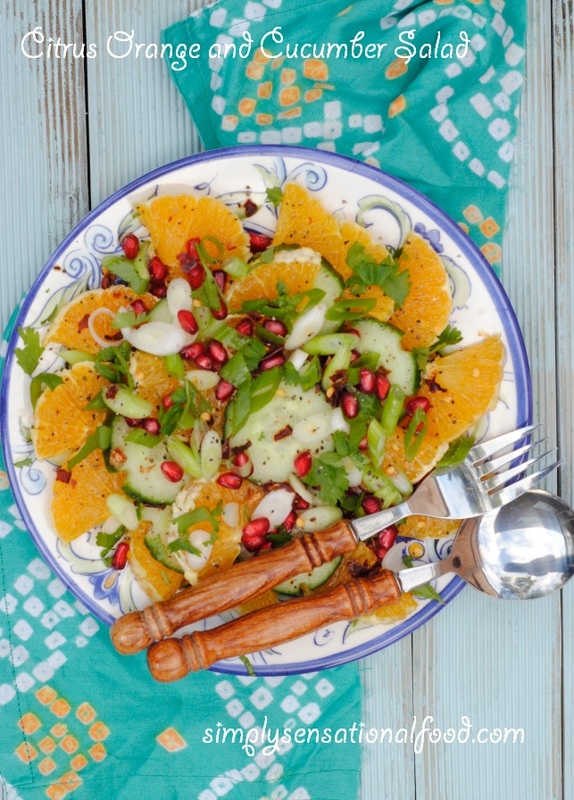 Tangy orange with refreshing cucumber and jewelled pomegranate salad in a delicious lemon dressing with chilli flakes and coriander. 1. In a jar with a lid add the lime juice, lime zest, olive oil, salt, chilli flakes and black pepper. Screw the lid on and shake the jar to combine everything. 2. Peel the orange and remove all the skin and pith and slice into rings and then cut the rings into halves. Place the orange slices onto a serving dish. 3. Slice the cucumber thinly into rings and arrange over the orange slices. 4. Slice the spring onions both the green and white parts thinly and scatter over the salad. 5. Scatter the chopped coriander and pomegranate seeds over the salad. 6.Drizzle the lime dressing over the salad. So colourful and pretty! It looks so fresh and appetising. This looks really good, i am not a fan of sweet and savoury, until recently taking part in a juicer challenge and realising that raw savoury and sweet foods do work well. I love all the ingredients, so imagine this to be really good. this looks so lite and lovely! i love rhonda's blog, all of her recipes are beautiful! Pomegranate....lime juice....chilli flakes...this sounds amazing, a delicious winter treat! This looks absolutely delicious. My mouth is actually watering. I love the look of this just so lush ,would never of thought of putting the orange with it. Sounds really fresh and tasty! Sounds like a great combination, I would never have thought to try it! My mouth is actually watering looking at the picture, I think I may have to attempt to recreate, im not usually a big salad fan, but this does look good. Very unusual combination but I would like to give it a try as it looks amazing. I love what you did adding the pomegranate seeds - really adds the perfect touch of extra color! So pretty! Love the vibrant colors! Lovely salad, I could eat it every day! I make this salad a lot! Except now I'm regretting that I never made it with pomegranate seeds, they look like perfect little jewels on an orange sea. Your photos look lovely! Psst, my background boards are from an old fence my neighbor took down. Chilli flakes and lime! I can almost feel them on my palate now. This looks super. The colors in that salad are so fresh. And beautiful!! I love how easy and simple this recipe is. I have been doing a lot of experimenting so I will add this to my list. I never thought about putting orange in a salad but it looks so colourful and delicious! Yum! There are lots of flavours here that I love independently so together - magic! That sounds and looks amazing....a perfect winter pick me up of feel goodness!! I think the pomegranate seeds make it look quite fresh and bright, definitely something we would try at home.